The runaway popularity of personal electronic devices has led to a huge global demand for compact yet powerful rechargeable batteries. Since hitting the market in the 1990s, lithium-ion technology has taken the lead in meeting this need. But concerns over the relative scarcity of lithium and the toxicity of other common lithium-ion battery ingredients such as cobalt are driving the search for an alternative. Sodium, around 1000 times more abundant than lithium, could be the answer. McGill University chemistry professor Eric McCalla is aiming to push the sodium-ion battery from concept to a commercial reality that will perform comparably to lithium-ion batteries but be less expensive to make and have a smaller environmental footprint. 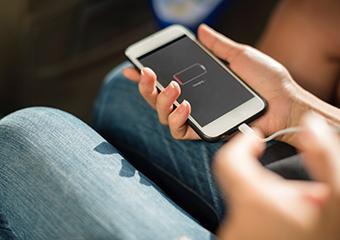 McCalla believes the secret to outdoing lithium lies in finding just the right metallurgic mix to create a high-performance sodium-based electrode. His team aims to accelerate that search by using combinatorial synthesis, a technique that allows 64 distinct samples to be cooked up in the furnace in one go. By working through three such batches in a week, McCalla and his team can investigate 192 compositions in the same time it would take to work through just 10 samples using conventional methods. This high throughput not only allows the researchers to try out more metallic combinations in less time, it also gives them greater freedom to explore combinations of three or four different metals rather than just varying the ratio of two metals in a linear fashion. “From a science point of view, we learn a lot about the trends in the phase diagram – what really matters. I have found in the past that there are regions of the phase diagram that exist that we didn’t know about because they are compensated by things that we weren’t expecting,” McCalla says. McCalla’s success in obtaining an MSSI Innovation Fund grant will help develop a proof of concept as a next step towards putting his high-throughput screening technique to work on the search for a cleaner, greener battery to power the next generation of portable electronics. The MSSI Innovation Fund provides funding to move sustainability-focused projects to the next stage of development, from activities required for commercialization to policy development. The Spring 2018 MSSI Innovation Fund competition awarded a total of $354,000 to fund five projects from three departments across two faculties.